If history, as we have suggested, is the story of human evolution in the past, it will not be unreasonable to suppose that past development of humanity contains lessons for the present progress and future evolution of humanity. But not many historians have looked at history in this developmental perspective. For example, a deep understanding of the causal factors behind the birth, growth and decline of civilization may reveal some enduring truths on human development which may be relevant for all times. In fact, some of the questions which arise during the study of important historical phenomena have deep developmental implications. What is the secret of the immense cultural creativity of a small city-state like Greece which provided most of the founding ideas and ideals of western civilization? Why did great cultures like the philosophic and aesthetic Greece or spiritual India, which enriched humanity with great and noble ideas and values, succumb to or were seriously disrupted by barbarian invasion? What are the success-factors behind the “Golden-age” of civilizations? Why did the golden-ages always pass and could not be sustained? What are the sources of vitality and endurance of a civilization? These are all not solely historical questions of the past but issues which confront us in the present. History does repeat itself. The problems, issues and events of the past tend to repeat themselves. There is an element of repetition in history though it may not be a mechanical repetition with a clock-like precision or sameness. We have to understand this important aspect of the nature of history. There are two causal factors behind repetitions of history. The first factor is that Nature works through repetitive rhythmic cycles. We can observe these cycles not only in physical Nature but also in our human and psychological nature. And in our spiritual conception, our human nature and its outer expression in life through history is part of universal Nature. The second factor is that there are some constants in human Nature and world-nature or universal Nature which remain the same behind all changes in time. And these constants are repeated or rediscovered again and again in the course of history. What are these constants? First, the fundamental laws, principles and structure of human nature and human life, World-nature and universal life, are a constant through the flow of time; second, the basic urges, needs, motives, faculties and powers of human nature are the same in essence through all the changes of history. Some part of human nature and its motives or faculties may dominate a certain epoch in history. But the whole of human nature, and all its motives and powers, is present and expresses itself at all times. This is the reason why certain situations, events, problems and ideas recur in history, though not in the same form. Whenever and wherever a part of human nature and its motives expresses itself forcefully in the outer life, it gives birth to more or less similar structures, events or problems or makes similar discoveries. For example, whenever and wherever the thinking or intuitive mind in man is able to plumb into the depths of the inner world or outer life and touch the fundamental laws, and principles of things, it gives birth to similar ideas or conclusion or discoveries. The ethical and spiritual teachings of saints, sages, and philosophers widely separated in space and time, are more or less the same in all ages of history. The law of unity discovered by ancient eastern sages in the spiritual realm by plumbing into the depth of their souls are rediscovered by modern scientific mind in the subatomic depth of matter. The vital nature in man, which seeks for power and expansion expressed itself in the ancient world, it created huge political empires and the same part expressing itself in the modern world creates global business empires. The ancient Roman genius for organisation reappears in the form of “Management” in modern business. And the problems of organisation faced by empire-builders of ancient India and that of modern multinationals, like for example the problem of centralisaiton and decentralisation, are more or less the same in essence, however different it may be in its outer form. What is the pragmatic significance in the repetition of history for human development? Does it have any significance at all? This brings us to the critics of the past who say that history has no relevance for the present or future. They argue that history has not much to teach because in this world “change is the only constant”. Life is like a flowing river. No two situations in space and time are the same. So past situations or solutions may not be a guide to the present or future. What worked in the past may not work in the present or future. There is much truth in this argument. For as we have mentioned earlier, the repetition of Nature in history are not mechanical repetitions. They are progressive cycles. For, change and progress are also one of the constants of Nature though not the only constant. So, it is undoubtedly true, that no two situations or problems in history are the same though they may be similar. The form, environment and the circumstances in which they recur are always different, though a discerning eye may detect some essential similarity behind the outer changes. Any attempt to revive the past forms and ideals as they are in the past is an uncreative exercise. For, Nature never repeats mechanically her old forms and ideals, but always progresses towards better forms and greater ideals. History should not be used as a support for reviving the past, but as a means for a better understanding of the present and a foresight into the future. But all these facts of the present or future do not invalidate our proposition that we can learn from the past. A deep understanding of a past event, situation or problem can give a better and a more holistic insight into a similar event, problem or situation of the present by indicating clearly and precisely what is new in the present situation. If we are able to penetrate sufficiently deep into a past situation and get into its root cause, we may stumble upon some enduring and timeless principles which are valid for all times. And if a past attempt, achievement or solution itself is based on such enduring principles, then it is valid for all times. For example, many modern management thinkers are discovering timeless managerial wisdom from the experiences and insights of past leaders in thought and action like Machiavelli, Churchill, Napoleon and even Shakespeare! As we have indicated elsewhere some of the organizational problems faced by empire-builders of ancient India and that of modern multi-nationals are more or less the same in essence. And some of the solutions suggested by modern management thinkers are very similar to the ones conceived by ancient Indian sages! Interestingly, we can find the most pragmatic use of the past in the modern corporate world. It is called “sharing best practices”. For example, a foreman or an engineer in a factory of a multinational in Bombay, India, faces a problem and solves it successfully. He puts the problem and the solution into the knowledge-management system of the company which can be accessed world-wide through the company intranet. After a few days, months or years another foreman or engineer of the same company in a factory in Sydney, Australia has a similar problem. The engineer in Sydney asks the knowledge-management system whether this problem occurred in the past anywhere in the company and how it was solved. The computer coughs up the solution arrived at by the Indian engineer at Bombay. The Australian engineer applies it to the problem he is facing, and surprisingly, it works! In a similar way, is it possible to “share best practices” on human development from the distant past of history? This may not be as easy as learning from the recent past. It requires a deep insight for compensating the inadequacy of information and the wide gap and change in time, space, circumstance and environment. But still a discerning eye which can penetrate into the essence and the root cause of things can find many useful lessons from the achievements of the past. But the study of the past yields its highest results only when it is accompanied by a quest into the universal truth of each activity of human life and a foresight into the future. For we are living in an unfinished world and the story of human and terrestrial evolution is not yet complete. When we have the aspiration for or insight into the highest, universal and integral truth, we may also have the insight to see how much of this universal truth is expressed in each phase of history and how much of it remains unexpressed or is yet to be expressed in the future. We may also be able to see some seeds of this unexpressed future truth in the past. Thus history, studied in the right perspective, values and attitudes, can lead to an intellectual equivalent of what the ancient Indian seers called “Trikaladrishti” or triple time vision which embraces the past, present and future in a single glance. 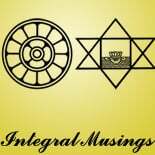 This entry was posted on June 7, 2016 by integralmusings in The Meaning of History.